As seen in The Telegraph: A History of Cadbury – in pictures. As featured by the Mail Online: How Cadbury's rose: Nostalgic photographs reveal how Britain's favourite chocolate manufacturer went from single shop to global empire over two centuries. You'll be £19.99 closer to your next £10.00 credit when you purchase A History of Cadbury. What's this? In 2024, Cadbury's will be celebrating 200 years of the first store opening. This is the story of how the company began, how it grew, and how they diversified in order to survive. I recommend this book not just for people who've enjoyed Cadbury's products, but anyone with an interest in 19th and early 20th-century history and labor practices. Cadbury did a lot right and that's undoubtedly a major reason why they are still around today. I love chocolate and I love history so it was no surprise that I thoroughly enjoyed reading this one! I would recommend it to anyone. Those who are fascinated with historical accounts presenting the inception of companies, the evolution of business practices among the 19th and 20th centuries, confectionary in the age of industrial revolution, and of course, anyone who enjoys chocolate would particularly be enlightened. I really enjoyed this look at the history of Cadbury chocolate and the Cadbury family. How it began, and prospered, through good times and bad, made a very entertaining story. The photographs are wonderful with my favorite being the Easter Egg production. Posters advertising Cadbury's are interspersed though out. Learning about Quaker John Cadbury's interest in the temperance movement and how he encouraged drinking chocolate as healthy alternative to alcohol was just one of the facts that personalized this history for me. The logistics that went into creating milk chocolate, designing elaborate boxes for the chocolate, and the way Cadbury treated its employees were eye-opening. Now when I'm savoring my favorite Cadbury chocolates, I'll be able to appreciate what all went into creating them. Fascinating. Chocolate is one of my favourite foods and it seems that the history of how the Cadbury family began the in the making of this wonderful food was a very adventurous one. The aroma, the taste and all the processes that were developed by the cadbury family to produce the wonderful chocolate that we enjoy today was well worth a read and I must admit it urged me out to the supermarket to purchase a purple wrapped block of Cadbury's finest. This book offers so much more than what you would expect. it’s not just about chocolate and you’ll love it. If you’re a chocolate lover, you’ll love this book. If you’re a history buff, you’ll love this book. If you’re looking for a book that will make you feel good as you read about how people help others, you’ll love this book. Definitely a great book to add to your must read book list! The story of the company is interesting and there were a lot of photos to illustrate their history and the people involved. An interesting read for non-fiction fans or chocaholics. A fascinating read that delves into a multitude of different themes from chocolate making to the slave trade, from housing provision to healthcare. Certainly well worth a read perhaps being accompanied by the consumption of one of their products. This is a comprehensive history of the company Cadbury’s. It looks into its geographical and business history as well as the social impact it had upon consumers and workers. What I particularly like is its explanation of the Bournville estate and its purpose; something that is useful when considering the impact of a blossoming company. For all of my life, Cadbury has been synonymous with chocolate, and I have always preferred Cadbury chocolate to the other brands, such as Galaxy. Diane’s charming and fascinating book tells the story of the Cadbury family and how they transformed the lives of the people of Bournville by building a model town for its employees. Over the years Cadbury has swallowed up loads of smaller chocolate companies, such as Fry, who still make my favourite chocolate bar, Fry’s Chocolate Cream, before themselves being taken over by the Americans, who tried to change our chocolate formula and failed. Long may they dominate the British chocolate world! The book is an absolute must for chocoholics! 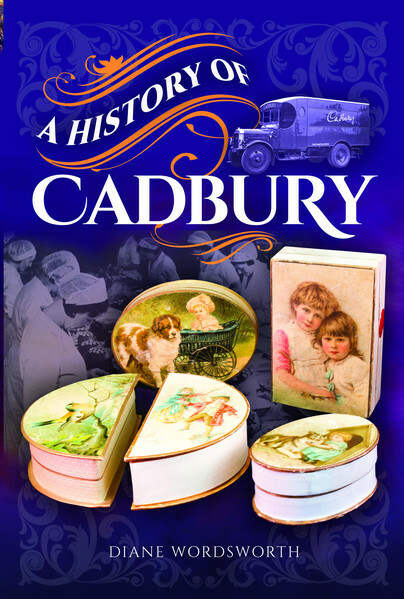 Diane Wordsworth has written a very approachable narrative of the Cadbury family and the development of the company... This is a great story and well-written. Amazing black and white images from a new book called A History of Cadbury show what life was like there, from crafting Easter eggs to playing football and cricket. This book tells of the chronology of the business and the Cadbury family, how chocolate is made, mergers and branding. Diane Wordsworth’s work has appeared worldwide. Primarily a broadcast journalist, she also edits and proofreads books and magazines. Diane moved from Solihull to Yorkshire in 2004, where she now writes and edits on a full-time basis. She is currently exploring an A to Z of Yorkshire with her husband, Ian.